For Sale: Have about (20) twenty old work horse collars. These collars are not presently usable, but maybe able to be repaired. Most are sawdust filled with clothlined. These collars' inside measurements are 18 to 28 inches. The price is $300 for the lot, may sell individuals starting at $20 each. Also have some metal work horse hames that would fit around the collars. Have some metal driving horse hames. Have about (12) twelve good usable work collars from 16 to 29 inch, they are priced from $40 to $100 each. 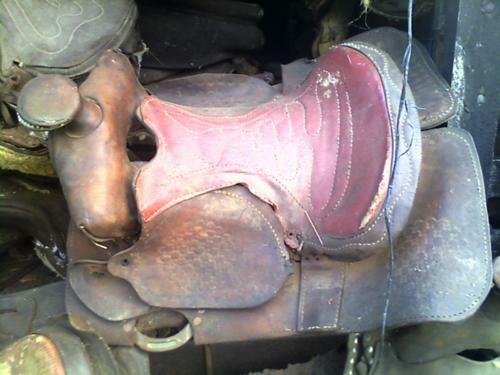 Also, have about (12) twelve old horse and pony Western and English saddles for sale. These saddles do not have stirrups or fenders. The price is $10 each if taking all, or $15 each if selecting individuals. Have complete usable saddles priced at $75 to $350 each. If interested in any of the above items, please call (724) 465-7826 or send your email address and I will send photos of items you are interested in.